Like a pointillist painting, this amazing book uses tiny moments, fleeting thoughts, shrewd observations, and spot-on quotations to fill a broad, detailed canvas. A mere 177 pages, Dept. of Speculation is a portrait of a marriage from courtship through parenthood, through a marital crisis, and beyond, examining both intense and mundane snippets from the perspective of the unnamed wife. Can someone truly comprehend the specificity and intimacy of someone else’s marriage? In this case, the answer is a resounding yes! Dept. of Speculation is a portrait of a marriage. It is also a beguiling rumination on the mysteries of intimacy, trust, faith, knowledge, and the condition of universal shipwreck that unites us all. Jenny Offill's heroine, referred to in these pages as simply the wife, once exchanged love letters with her husband postmarked Dept. of Speculation, their code name for all the uncertainty that inheres in life and in the strangely fluid confines of a long relationship. As they confront an array of common catastrophes a colicky baby, a faltering marriage, stalled ambitions the wife analyzes her predicament, invoking everything from Keats and Kafka to the thought experiments of the Stoics to the lessons of doomed Russian cosmonauts. She muses on the consuming, capacious experience of maternal love, and the near total destruction of the self that ensues from it as she confronts the friction between domestic life and the seductions and demands of art. 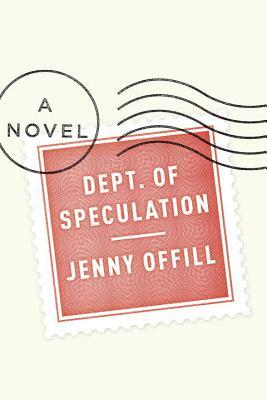 With cool precision, in language that shimmers with rage and wit and fierce longing, Jenny Offill has crafted an exquisitely suspenseful love story that has the velocity of a train hurtling through the night at top speed. Exceptionally lean and compact, Dept. of Speculation is a novel to be devoured in a single sitting, though its bracing emotional insights and piercing meditations on despair and love will linger long after the last page. Jenny Offill is the author of the novel "Last Things, "which was chosen as a Notable Book of the Year by" The New York Times "and was a finalist for the L.A." "Times First Book Award. She is the coeditor, with" "Elissa Schappell, of two anthologies of essays, "The Friend Who Got Away "and "Money Changes Everything. "Her children s books include "17 Things I m Not Allowed to Do Anymore, 11 Experiments That Failed, "and "Sparky. "She teaches in the writing programs" "at Queens University, Brooklyn College, and" "Columbia University." "A magnetic novel about a marriage of giddy bliss and stratospheric anxiety, bedrock alliance and wrenching tectonic shifts . . . So precisely articulate that [Offill's] perfect, simple sentences vibrate like violin strings. And she is mordantly funny, a wry taxonomist of emotions and relationships . . . She has sliced life thin enough for a microscope and magnified it until it fills the mind's eye and the heart."